A friend recently asked me who is the one person other than Jesus who we know to be in heaven, if we believe the gospel record. There may be other possible answers, but perhaps the clearest is the Penitent thief, or the Thief on the Cross – the one to whom Jesus says ‘today you will be with me in Paradise’. This story is one of the only obvious moments of light, hope and redemption within the unremitting horrors and darkness of the Good Friday narrative. The Penitent thief is only featured in one gospel account (Luke’s). In Matthew’s and Mark’s versions both criminals crucified alongside Jesus hurl insults at him. Make of that what you will, but it’s still I think a very important vignette. It’s surely the most dramatic (and perhaps the only) story of 11th-hour conversion in the pages of Scripture; very much a ‘deathbed’ repentance. Not the ideal way we might want someone to come to faith, perhaps, nor the ideal setting, but one that can give hope and encouragement to pretty much anyone. Few of us can be in a worse place than that crucified thief, yet he is given the cast-iron guarantee of salvation that few others can boast. Tradition calls him the ‘penitent’ thief, but we do not actually see him repenting in the way that most Christians would understand the term. There is a form of confession but no apology, no ‘sinner’s prayer’. All he does is acknowledge that he has committed a crime and therefore deserves the punishment he’s receiving; and he then asks Jesus to remember him when he comes into his Kingdom. That’s all – and it appears to be enough. It’s wonderful how simple and uncomplicated it all is. The man does not do anything, nor need to do anything, except simply recognise Jesus at least partly for who he is – the true King, of the true Kingdom – and ask Jesus simply to ‘remember’ him. (Not ‘save’ him, but simply keep him in mind, be aware of him, not forget about him.) There’s no begging or bargaining; it’s just a very simple and humble request. If we take this story seriously, it radically simplifies the requirements of Christianity – at least the entry requirements. We don’t have to be baptised to be saved. We don’t have to go to church, understand difficult theological doctrines, memorise scripture, speak in tongues or go on mission trips to be able to call ourselves Christians. We just need to turn to Jesus. All these others can be good and helpful things, and if we lead long Christian lives we may well end up doing many of them. But they are not required in order for us to be part of the Kingdom, for us to be remembered by Jesus and be with him in Paradise. Well, I meant to post this at Christmas, but Christmas got in the way. It’s such a familiar passage, and such a beloved one – the first Christmas angels’ wonderful, universal message of God’s peace for all people. For many it’s a timeless source of hope and comfort in a troubled world. I really love this passage, but it raises some difficult questions for me. Where is this long-promised peace? Is it really for everyone? And does the peace Jesus brings look anything like the kind we expect and want? So my initial and somewhat cynical reaction to the angels’ message is ‘Peace on earth? Fat chance’. Looking around at the world, the ancient promise of peace can seem pretty hollow – at best an idealistic pipe-dream that can never become reality. Right now I see the unending tragic bloodbath of Syria’s civil war, in turn helping fuel an ever-worsening refugee crisis as well as terrible terrorist atrocities, in turn encouraging the rise of right-wing extremist parties in Europe. I see a divided UK post-Brexit, a divided US post-election, an unravelling Europe, a terrifyingly unstable Middle East, and a frighteningly autocratic and aggressive Russia. And looking inward at my own heart and life I often see precious little peace there either. I see a legion of anxieties, fears, stresses, guilt and countless other things that make for un-peace. So, over two thousand years since the Christmas angels first brought their words of hope, why are we still not seeing the peace they promised? Of course, the promise could just be a lie, or perhaps a mistake – but I don’t really believe that. It could be merely a salutation or greeting – the heavenly equivalent of “Hello” or Happy Christmas!” That’s more plausible, but I still don’t quite buy it. Perhaps we’re simply still waiting for the promised peace to come. Or perhaps – and I think this is most likely – we’ve simply misunderstood the peace the angels are promising and how to enter into it. Perhaps God’s peace has already come to us, but it’s not how we imagined so we miss it. Who is the promised peace for? “Glory to God in the highest, and on earth, peace to all on whom his favour rests”. Looking at this you’d hardly know it was the same verse of Scripture – in the NIV it has become a limited and exclusive peace only for those whom God specially favours. How do we make any sense of this? I’m not a Greek scholar, but looking at other versions you get the impression the translators are struggling to make sense of an unclear clause which can be read in various ways. Some have a half-way version: “Peace to all men of goodwill (or men of favour)”. So it’s either God’s peace and goodwill (favour) to all men, or it’s God’s peace to all men of goodwill (favour). And if it’s the latter, it could either be peace to the people whom he favours, or to those who embody goodwill. This highlights to me one of the problems of relying on the Bible as our sole source of truth, because in some key places like this its meaning is unclear and ambiguous. So which version is true? I think this is where you have to decide what kind of God you believe in. Is he a God who only cares for a limited few, perhaps only those who believe in him or follow his ways? Or is he a God whose mercy and grace are unbounded and for all? For me it has to be the latter. It must be peace and goodwill for all, not merely a few. Perhaps not all will want it or accept it, but it is freely offered and available to all, always. What is God’s peace like? I’ve said that maybe we don’t see the angels’ promised peace because it isn’t the kind we expect. Perhaps the peace Jesus brings is not an overwhelming peace that forces itself on our notice, a peace that everyone can see and that we cannot help but receive. Perhaps it is rather a quiet, hidden, even shy peace which we have to discover and nurture for ourselves, and within ourselves. A little paradoxically, I also believe that God’s peace – shalom – is an active, living thing, the vibrant presence of his life and love and hope. God’s peace is not merely a passive or empty thing, an absence of conflict and strife. Why do we not choose peace? I also suspect that God’s peace may be something we have to welcome actively – it doesn’t always occur in us automatically. But this can be hard. The path to healing and so to true peace often requires us first to open ourselves up to pain, perhaps the pain of acknowledging things about ourselves and our lives that we’d do almost anything to avoid facing. So we too often lock ourselves away in refuges which become prisons. God calls to us to come out, and until we do we are not truly at peace. The other thing is that Jesus’ peace is not always obviously desirable. It can be deeply troublesome to any who have a vested interest in the current world order, the status quo. Perhaps this is how Jesus, the promised Prince of Peace, can proclaim “I have not come to bring peace but a sword”. His peace is paradoxical, sometimes problematic and even divisive. God’s peace is available to all, but not all want it. I believe God is seeking ‘people of peace’, or ‘people of goodwill’; people who truly desire the kind of life and world that God offers and are prepared to work with him to bring it about. God excludes no-one, but perhaps we may exclude ourselves if we wish. So in response to the angels’ message, I acknowledge that all too often I’m not a person of peace, and that too often I do shut myself out of the peace God wants to bring to the world. I pray that I – that we all – will be able truly to welcome God’s active, living, surprising peace within our hearts, our homes, our work, our worries, our weaknesses and problems, the whole messy reality of our lives. And I wish you all a truly peaceful and happy New Year. Like many, I’m still reeling from the US election result. Right now, and from right here, the world’s future looks more uncertain and more troubled than ever. God clearly didn’t answer my prayer not to let Trump be elected president, nor the prayers of millions of others asking the same thing. But did God actively answer the prayers of those who wanted Trump in, or was the decision effectively out of his hands – or one he washed his hands of? Was God’s will done in the US election result? And more widely, how much is God’s will done on earth? To what extent do world events and events in our lives reflect his plans and purposes? For the true deist, God watches and judges human affairs ‘from a distance’, never intervening in this world. Some feel that for God to get involved in our messy business would be to sully himself, or would inevitably mean some form of partisanship (like favouring the nation of Israel for example), which they feel would be incompatible with his perfection. So by this view, God leaves us entirely to determine our own fates. The US election result is therefore purely and solely human, with no divine involvement – a view for which I find I suddenly have some sympathy. Sometimes it does feel very much as though God is absent or far-off, that he does not heed our desperate cries for help and change, that he is not involved or even interested in the mess and muck of our lives and situations. We see thousands dead, starving or displaced by conflicts and disasters, we see evil rulers and regimes prospering and good people oppressed, and it’s easy to believe that God has simply abandoned humanity or remains aloof, emotionally as well as physically uninvolved. Yet I simply cannot and will not accept that this is the reality. I’m not sure whether God has entirely human-like feelings, yet I am convinced that God is passionately involved in this world, that he cares hugely about us, what we do and what happens to us. And further, I believe that he is actively involved – but that often his hands are tied, or that he plays the long game. For the true determinist or extreme Calvinist on the other hand, God is utterly sovereign and everything that happens, for good or ill, does so because he has willed it – or at the very least has allowed it to happen for his greater purposes. By this view, Trump’s recent victory must have been God’s will and plan. Though some might say that God had brought it about to punish humans rather than to bless them – a view which would chime slightly more with how I feel, though I can’t really accept it. For if the extreme determinist view is correct, then all wars, famines, rapes, murders and other atrocities are in some way the result of God’s will. Proponents argue that God has the right to do whatever he chooses with his creation, and that all humans are sinful and deserving of punishment; or else that suffering is often our only route to redemption. I can’t logically refute this view – I can only say that it does not look like the God I think I know a little in Jesus. Is God’s will always done? So is God’s will always done on earth? No, I absolutely do not believe so. I don’t think that Jesus would have instructed us to pray ‘Let your will be done on earth, as it is in heaven’ if that were already and automatically the case. God’s will is not and will not be perfectly done until his kingdom comes fully and his reign is complete over all the Earth. In the meantime we must live in the messy in-between space of the ‘now and not yet’. God’s kingdom and life keeps breaking through the cracks in our old world order, but for now that old order still dominates and mostly does not reflect God’s character or purposes. Instead the old cruel laws of entropy, gravity and inertia reign, and by grace we endure and resist them as best we can. But isn’t God sovereign? Yes, but he has chosen to delegate some of his authority and responsibility to us his creatures. He lets us make real choices with real consequences for good and ill. He may warn us but he does not step in to prevent us choosing badly, nor bail us out every time things go wrong. You could perhaps say that God’s hands are tied by his love, which cannot coerce but can only woo and persuade. And his hands are also tied by his desire for our development, our maturity and character, which can only be formed by the long, slow and often painful processes of real life in the real world; of taking responsibility and overcoming adversity. So there is much that I believe God will not do to intervene. But what I believe he does do is work redemptively on the material we present him with. I believe that he also works incarnationally, in and through us as far as we let him. We are his hands and feet, his body on Earth; we are his flawed image-bearers and kingdom-bringers – God help us. So I believe that we see God at work not so much in the great powers of this world but in the small and hidden things, the slow quiet changes unnoticed behind the scenes; the gradual transformations within each of us. And I also think God plays the long game – he is focused not so much on quick solutions for today or tomorrow as on long-term goals for years or even centuries ahead. I also wonder, tentatively, whether sometimes God may not allow evil to prosper for a limited time for reasons we can only guess at. Perhaps it’s because adversity strangely seems to bring out the best in humans, uniting us and growing our characters. Or perhaps it’s to give us an opportunity to stand for light and against darkness; to meet cruelty with kindness, and brutality with humanity; to overcome evil with goodness, and show that in the end love wins. Perhaps. To my mind, Trump’s election represents a victory for the bad old order of things that will one day be swept away by God’s kingdom. I don’t believe it was God’s good and perfect will. I feel that there are dark days ahead for the world, and for many in America. But God is with us in our darkness. The light shines in the darkness, and the darkness has not – and will not, ever – overcome it. I’m not sure if this is more a heartfelt last-ditch appeal to the good people of America, or a desperate prayer to God. I’m not really expecting this blog to make a difference – but I have to do something, say something, perhaps just to kid myself that I’m not merely sitting helpless, powerless and voiceless while the fate of the world is decided. So going with the illusion that this will any difference, I beg the American people with all my heart – don’t elect Donald Trump. Elect almost anyone or anything else you like – a trained baboon, a stuffed sock, a space alien with tentacles for a face. Anything. But please don’t elect Donald Trump. I know full well that Hillary Clinton isn’t perfect. But the very worst thing she’s alleged to have done surely pales into utter insignificance next to the horrific prospect of a Trump presidency. His unrepentant sexism and racism, his rampant nationalism and warmongering must surely be anathema to anyone without a penchant for dressing in white robes and setting light to crosses. Donald Trump in charge of the Free World is unthinkable – yet it might so easily become reality, if you let it. Of course, I do realise that there are checks and balances in the US governmental system, that were Trump to take power he probably wouldn’t be able to do half the crazy-awful hate-filled things that have randomly popped into his head and spewed out of his mouth during election campaign speeches. Yet even so, the idea of Trump at the helm of the largest and perhaps greatest democracy on earth, or with his finger anywhere near the red button, is appalling and terrifying on every level. I know I mustn’t demonise Trump or his supporters – we must think of him and treat him as a human (though if you’ve watched any Doctor Who, I can’t help thinking ‘Slitheen’ whenever I see him). But whatever he may or may not be, he’s not a president – please, America. Please, God. To those who believe that Trump is the best candidate for Christians – look again at his life, his character and his words, and then read the gospels. Does anything Jesus says or does look in the least bit like Donald Trump, or vice versa? One evangelical pastor has observed that electing Trump would be like doing the deal with Satan that Jesus rejected in the wilderness – ‘give me your allegiance and I’ll give you power, peace, security, victory over your enemies’. And to those who read the book of Revelation looking for signs of the End Times, I hope you’re aware that the prophecy clearly states that the Last Trump will usher in Armageddon… okay, okay, I’m joking. But right now Trumpageddon feels as bad as anything predicted in St John’s terrifying apocalyptic visions. So rise up, worthy and intelligent people of America. You’re better than this – even if you can’t in conscience vote for Hillary, please don’t give us Trump. Some of you may justly be asking what business the US election is of mine, and what right have I to comment? But the outcome of who gets to lead the USA will also affect the whole world, yet the rest of us have no say in it and can only watch in fascinated fear. So I appeal to you on behalf of all electorally unrepresented yet deeply involved humanity, remember us and don’t let Trump win. Please. Some may also ask why make such a fuss just about the US election – why didn’t I make the same appeal to the Russian people not to re-elect Putin? Perhaps it’s because I actually trust American democratic processes and believe that the outcome of the election won’t just be rigged. Perhaps it’s because, despite our many differences, we do speak (almost) the same language and share a fairly huge amount of cultural heritage and values, whereas Russia is largely alien and mysterious to me. Perhaps because I wasn’t aware of the Russian ‘election’ till after it had already happened. Oh, and perhaps because I’m scared of Putin. Finally I turn my appeal to God. Lord, looking at history it’s pretty hard to see your involvement in the rise to power of so many world leaders, from Caligula and Nero to Stalin and Hitler, or indeed to today’s Assad, Putin and Mugabe. Perhaps it’s easier to see your hand in the (preferably non-violent) opposition to such bad leaders and regimes than in their election. And I suspect you allow those of us who are fortunate enough to live in democracies to decide our own political fates to a pretty large extent, without controlling who gets to take power. Nonetheless, I have to pray about this, for prayer is the only weapon of the disenfranchised and the desperate. Please Lord, don’t let Donald Trump become President of the USA. However bad we’ve all been – and I know that’s pretty bad sometimes – don’t visit that on us, please. Send lightning bolts and locusts, plagues of frogs and hail to lead us to repentance, but not Trump. Do you remember the Old Testament story of Saul among the prophets (1 Samuel 19)? Poor Saul’s been rejected by God as Israel’s anointed king in favour of the popular hero David, and has begun his descent into madness, badness and dangerous-to-know-ness. And on this particular occasion, he’s on his way to kill David when he runs into a bunch of prophets who are, well, prophesying. And unexpectedly the Spirit of God comes upon even Bad King Saul, and suddenly he’s prophesying away ecstatically with the best of them for hours on end (and lying naked on the ground into the bargain). It’s an odd story, and hard to understand. Was God simply protecting David, or was he giving Saul another chance? The reason I mention it is that just recently I’ve been feeling a tiny bit like Saul among the prophets. Let me explain. I kind of hope I’m not following Saul’s overall trajectory, though some evangelical friends might see it that way. What’s certainly true is that for a long time I’ve felt like I’m not really a ‘proper’ Christian, and experiences of church have often contributed to that feeling. Readers of this blog may also have noticed that my theology has gradually become less evangelical, as I’ve started to question and rethink many of the touchstone doctrines of Reformation Christianity – biblical inerrancy, penal substitution, hell, homosexuality, who gets ‘saved’ and what that even means. And for a long time I’ve felt pretty uncomfortable with this move. I’ve feared that in shaking off the conservative shackles I may simply be backsliding headlong into apostasy and heresy. Not unlike Saul. But then, just in the last few months, I’ve finally started to feel more settled. Going to Greenbelt festival recently felt like coming home and breathing the free air – a sense of relief at being among people who think and feel as I do. Yet at almost the same time another movement has been re-starting in my spiritual life, and apparently in a very different direction. While my theology’s becoming more liberal, my worship’s becoming surprisingly charismatic – again. Perhaps it isn’t so unexpected. For a long time I’ve been involved in (jargon alert) ‘leading worship’ in the moderately charismatic, fairly open evangelical Anglican church where I re-found faith 20+ years ago. I took a break a couple of years ago, partly because of life circumstances and partly for spiritual reasons, but just recently I’ve returned. And a few weeks ago I led worship again for the first time in a full Sunday morning service. If you’re not familiar with charismatic Christianity, worship and worship-leading are big things. The often extended times of worship carry an expectation of entering into God’s direct presence through heartfelt singing, perhaps also with singing in ‘tongues’ and occasional outbursts of spontaneous praise. There’s a belief that the Holy Spirit will move upon worshippers, touching hearts and changing lives. And it was in this worship context that I first found a sense of connection with God years ago, in a way that academic theology or Bible preaching hadn’t been able to achieve (and still haven’t). I love theology, but it’s in sung worship where I feel I most directly and deeply encounter something of God’s presence. And that’s even so when, as now, I’m not sure I can agree with the words of the songs I’m singing, and even sometimes query the whole theological framework of charismatic worship. Furthermore – odd as it may sound – I’ve long felt that I’ve somehow been gifted, even perhaps called, by God to lead others in sung worship. In doing so I’ve frequently felt caught up in something bigger and better than myself, and often others have responded too, reporting that they’ve experienced something of God’s presence. I say all this because right now I find it confusing and contradictory. My mind and my theology have become increasingly liberal (cynical even), but somehow my soul still comes alive and sings in worship. And I’m glad of that but also unsettled by it, unsure what to make of it or do with it. And so it was this time. Before the service I felt nervous, unsure of whether I could even do this thing any more, at least with any integrity. But as I gave myself to the music, my doubts fell away and I felt that sense of being caught up and carried along on a greater tide. And the response from the congregation was incredibly positive and affirming. Suddenly I was in a very different role and position to my accustomed (largely self-chosen) one of disaffected and disengaged outsider. Hence Saul among the prophets. Here’s me, seemingly backsliding, cynical and liberal, unsure if I’m even really a Christian, suddenly leading the faithful in praise, and God’s Spirit apparently showing up. Now it’s not that I’ve felt no sense of God’s presence throughout my supposed ‘backsliding’ phase. But what made this time different was the church context; the head-on collision between the liberal and charismatic parts of my faith. So do I now simply set aside all my theological questioning and doubts, and plunge back wholeheartedly into charismatic, even evangelical Christianity? Part of me would like to, but I don’t think it’s quite that simple. For now I probably just need to accept that there’s something of a disconnect or tension between my theology and my worship; between my Christian head and heart. But maybe that can be a creative tension rather than a destructive one. I hope my experiences of worship can stretch and challenge my theology, and my theological questing can inform and deepen my worship. I’m really not a natural camper, so it takes something pretty amazing to persuade me to spend 3 nights under canvas, away from the comforts of home and forced to use frankly horrible toilets. This August bank holiday, that pretty amazing thing was the annual Greenbelt festival of arts, faith and justice. There’s nothing quite like Greenbelt. If you’ve been to other Christian gatherings like New Wine, Spring Harvest, Keswick Bible week or whatever the equivalents are in other countries, it’s nothing like those. I’m not knocking them and I’ve found them helpful before. But those are effectively Christian conventions with a slight festival vibe; Greenbelt is a full-on festival with a few talks. Think of it as the Christian answer to Glastonbury. What stands out most for me about Greenbelt is its overwhelming atmosphere of open-heartedness, inclusivity and playful creativity. It has space for voices across the range of Christian traditions from ultra-liberal to (open) evangelical, Catholic to Protestant, Quaker and Franciscan. 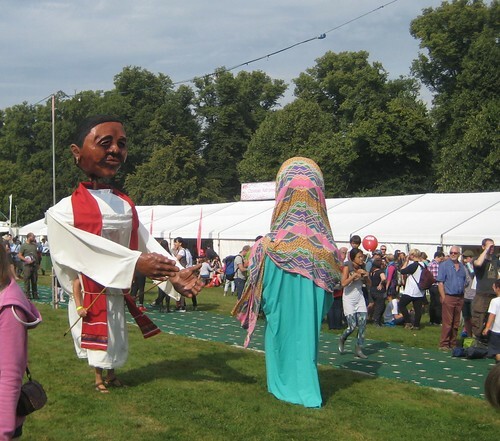 Greenbelt also welcomes Buddhists, Muslims, agnostics and atheists to the platform, as well as people across the whole spectrum of gender and sexuality. In other words, it’s not really for ultra-conservatives. 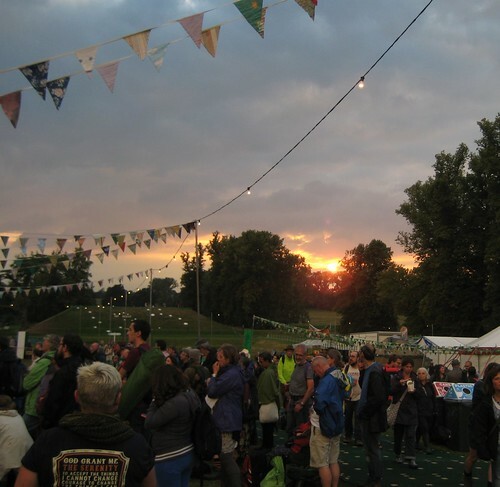 This was the third year of the festival’s latest location in the wonderful grounds of Boughton House, Northamptonshire. The move from Cheltenham Racecourse has its downsides – all the venues are now in tents rather than buildings, which reduces comfort, removes the nice loos and limits some options for activities. But it feels much more like a festival now, and it helps to be surrounded by natural beauty rather than betting adverts. Greenbelt has changed significantly in other ways too. Recently the economic climate and dwindling numbers have forced organisers to downsize and drop some of the bigger names, most noticeably in the music programme. Previously I’ve enjoyed the likes of Athlete, The Proclaimers and Billy Bragg; this year I didn’t know any of the bands, though some still sounded pretty good (when they weren’t stopping me getting to sleep). Any loss in music was more than offset by some outstanding performing arts and comedy. Best for me were Barely Methodical Troupe’s Bromance, an exploration of the awkward interplay of male friendships using jaw-dropping acrobatics, breakdancing and hoop stunts; and the hilarious and touching Steampunk drama Grandad and the Machine. The talks at Greenbelt are almost always first-class, if you’re looking for something a bit unconventional and unconservative. There weren’t so many big names this year – no Brian McLaren, Richard Rohr, John Polkinghorne or Rob Bell. But we were treated to refreshingly sweary tattooed US pastor Nadia Bolz-Weber; former hostage Terry Waite; Iona community leader John Bell who also leads the fantastic annual ‘Big Sing’ and Greenbelt regular Mark Yaconelli. My best new find was Chris Meredith, theology lecturer at Winchester – his Antidote to Bible Studies were the sharpest, freshest and funniest Bible commentaries I’ve heard in years. Altogether I laughed a lot, learnt a lot and was moved to tears twice by the talks. My one gripe with Greenbelt is that they used to make all the talks from current and previous festivals available to download on their website, and any from 2 years ago or older were free. They’ve now removed all the old ones, which is a great loss. I mentioned Greenbelt’s open-hearted inclusivity and playful creativity. These were best expressed for me in the Sunday Communion service, always a central feature of the festival. At first I feared I wouldn’t feel part of it as we couldn’t fit into the main tent area where all the action was, but I needn’t have worried. We were asked to form into groups of 10-12, and we were welcomed into a group from the L’Arche community (for people with Special Educational Needs). Each group was given a communion pack containing bread, juice rather than wine… and kazoos, which came with a warning ‘may not be suitable for adults suffering from excessive dignity’. These were to accompany a joyous and hilarious liturgical song led by the fabulous Fischy music, looking ahead to the time of peace and reconciliation when God’s Kingdom comes. The idea was based on Isaiah’s ‘lion shall lie down with the lamb’ passage but Greenbelt had riffed on it so that Republicans and Democrats were playing something daft like Tiddleywinks together, and UK PM Teresa May was offering opposition leader Jeremy Corbyn her seat on the train. All the liturgy and songs were fresh, creative and meaningful, and the whole service was by turns gloriously silly, moving and challenging. It was also all led by children, and presided benignly over by Archbishop Justin Welby, who entered into the spirit with endearing lack of pomposity. Not everyone loved it – one man near us bemoaned the lack of familiar songs, complaining that even “Stand up, stand up for Jesus” had been altered to make the words inclusive: “Stand up for lesbians in Gaza” as he parodied. Which actually captures the Greenbelt spirit nicely – if everything in you revolts against that idea, maybe it’s not the festival for you. The overarching theme of this year’s festival was ‘Silent Stars’, referring both to the whole of creation singing God’s praise, and to all the unsung heroes quietly working for social justice and a better world. On the opening Friday night the silent stars glowed above us in a perfectly clear dark sky. But it wouldn’t be Greenbelt without rain, and the following day we were battered by a sustained torrential downpour, a glorious thunderstorm, tent-threatening winds and apparently even a small tornado. Some Christians might see these as signs of divine disfavour on a gathering of hopeless heretics and backsliders, but the good people of Greenbelt mostly enjoyed (or endured) it as part of God’s wild and messy creation. For me, the storm broke in the middle of a Franciscan worship time exploring how we’re fellows with the created world including ‘brother fire’ and ‘sister water’, so the weather underscored rather than undermined the point. And throughout the long weekend, the loveliness as well as wildness of creation was a constant companion. I felt closest to God walking alone among the quiet beauty of the grounds, surrounded by trees and lakes, the sounds of water and birdsong. I’ve said before that going to church sometimes makes me feel like I’m not really a proper Christian. By contrast, Greenbelt made me feel that there might just be room in the broad Christian fold for folks like me – people who aren’t too sure where they stand on most things, but are still hoping to stand somewhere near-ish to Jesus. So in short, if you can survive camping and afford the ticket price, aren’t too theologically conservative and want your soul to be refreshed, get to Greenbelt. It’s one of the best things I’ve done this year. And here’s a rather amusing article affectionately mocking Greenbelt in Premier Christianity magazine: How to be a Hipster Christian at Greenbelt. One of the problems with the usual model of spiritual or religious development we’ve inherited is that it too often places the ‘spiritual crisis’ only in the past – ‘I was lost, now I’m found’. So we’re allowed the single pre-Christian spiritual crisis which catapulted us to conversion, but this is now safely behind us (hallelujah!). And we’re taught to view any post-conversion spiritual crises as dangerous, to be feared and avoided. We’re afraid they will lead us out of the security of faith into heresy and apostasy; will pluck us off the straight and narrow way where we’re safe and saved, and throw us into perdition. But I think the truth is that for many of us there’s equally a spiritual or faith crisis to come after conversion – perhaps even an ongoing cycle of crises. And rather than being something we should fear or shun, I think we can embrace these as a normal and necessary part of the life-cycle of our faith. Indeed, these crises may even be one of the key means by which we grow and develop. Yes, crises of faith are often difficult and can be destructive. But they are, I believe, inevitable and even vital, rather as volcanic eruptions and earthquakes are a necessary feature of our living planet’s life-cycle. Without them, our faith stagnates and doesn’t fully develop; we stay stuck permanently at the baby stage of spiritual development. Only by going through these crises (and, yes, eventually coming out the other side) can we truly reach the mature fulfilment of our faith. What do I mean by a spiritual (or faith) crisis? For me it’s a time when your faith, theology or beliefs are radically challenged, perhaps to the extent that you consider leaving church or even giving up your faith. It may be that you can no longer accept some fundamental tenet of your faith (biblical inerrancy, say, or the church’s teaching on homosexuality or the ultimate fate of non-believers). Or you may have become disillusioned with church leadership or the behaviour of fellow Christians, or feel that God himself has let you down. Maybe you’ve been persuaded by the arguments for a different religion, or for atheism. Or perhaps some personal issue or struggle makes you feel you can’t call yourself Christian any longer. Sometimes these things hit suddenly, precipitated by a particular event or realisation. Other times you may reach a ‘crisis’ point only after a long and gradual period of change. Spiritual crises force us to rethink, to re-evaluate our beliefs and practices. What do we really believe? Are we really Christians any longer, and do we want to be? It was a long, slow spiritual crisis that prompted me to start this blog 5 years ago, writing to explore my doubts and concerns about the faith that I’d grown up in, walked away from and re-converted to some 15 years previously. In some ways I’m still going through the same long crisis now, trying to work out what I really think and where I belong spiritually. Sometimes I yearn for the old certainties, but I can’t go back – only forward. We often fear spiritual crises because we associate them with someone losing their way, or losing their faith. And of course this can be the case – but I don’t think it needs to be. Unfortunately, we often don’t properly help people face their faith crises, and ironically this may be because we’re so frightened of them ‘falling away’. What people need at these times is not Christians quoting the Bible at them or warning them against the deadly perils of sin, apostasy and backsliding. People honestly questioning their faith need support, care, understanding, acceptance. They need to be listened to, without judgement or condemnation or platitudes. If we could lay aside our panic about people losing their salvation and concentrate on just being there for them, I suspect that far fewer would ‘fall away’ (whatever exactly that means). But… even if people do fall away or walk away, I’m not sure that’s always as final or as terrible as we sometimes feel. Sometimes people need to walk away from their previous expressions and experiences of faith, which may have been overly simplistic, restrictive and even psychologically unhealthy. Psychologist M. Scott Peck noted that many people who came to him for counselling changed their religious beliefs as a result of their emotional growth. Some came to him as confirmed atheists and many of these he encouraged to explore a more spiritual dimension to their lives. Yet others came to him with strong but emotionally unhelpful religious convictions. These had often been brought up with a very rigid, fear-based and fundamentalist Christianity, and after counselling many became agnostics or even atheists. Scott Peck saw this as growth for them, because their former religion had been soul-destroying not life-affirming, spiritually stunting not liberating. I think this ties in with Franciscan Richard Rohr’s idea that our inner life is formed of two major phases. The first phase is about forming our identity or forging our ego (Rohr calls it ‘the container’), and it requires exclusion and exclusivism. We set up rigid boundaries or container walls – deciding who’s in and out, who’s right and wrong, who’s good and bad, and defining ourselves accordingly. Our group is the ‘in’ group, the good and right group; others and outsiders who don’t belong to it are wrong or bad. We have to go through this phase, but we then have to move on from it to become our full and free selves. Christians often make two mistakes here. If our first-phase identity wasn’t Christian, we may try to rush on out of it too quickly, attempting to shortcut from ‘sinner’ to ‘saint’ by simply denying our dark side and trying to be perfect Christians, but without going through the long hard journey of inner transformation. But if we were brought up as Christians, the equal and opposite mistake is to stay stuck in the first phase, clinging on too tightly to our old Christian identity when we need to let at least some aspects of it go. To enter the second phase, Rohr suggests, we have to go through a crisis of ‘dying to self’ (that is, to the old ego self or ‘false’ self). Only then can we can start to discover our full, free, real self in Christ. We have to emerge from the rigid container with its divisions of in/out, either/or and goodies/baddies. But unfortunately religion can too often become a way of keeping us stuck in the first phase – particularly for those who were brought up in the faith from the cradle, or who converted into a highly fundamentalist religion. There can be a lot of fear and resistance to moving on, to breaking out into a freer and more life-affirming form of belief. So when people turn away from their former faith, that may not always be a bad thing spiritually, and it may not be the end of the journey. Some will later return to a better and more freeing form of faith. Others may not, but by God’s grace may still be growing spiritually outside the container walls of the church, its beliefs and teachings. I think God may be big enough for that. No, this isn’t a post about Brexit, though it does feel strangely appropriate under the circumstances. In the past I’ve written about an experience of grace, a time when I felt a deep and unexpected sense of God’s goodness towards me and my gratitude to him, and on another occasion an experience of encounter when I felt overwhelmed by God’s presence. This is the flip side of that – the polar opposite. Earlier this week, walking home from work I felt a profound sense of the absence of God. I felt that he was simply no longer there, or not interested at all; that no-one was listening to my prayers, and maybe no-one ever had been. The sense was very strong for maybe an hour or so, but lingered on in the background for a few days. Whether this feeling was in any way accurate or not, I don’t know. I suspect it may simply have been caused by tiredness and a particular set of circumstances – but it felt very real. I don’t write this looking for sympathy or spiritual advice, but simply to share an experience which I suspect is common to many people. It’s a deeply unsettling one, but not necessarily a bad one, or a sign of being hopelessly lost (I hope). I’m writing about it in the hope of processing it for myself and also perhaps offering some encouragement to others who undergo similar experiences. I’ve compared the faith journey to that of a love relationship, and this experience felt very much like the break-up of a marriage, or the loss of a life partner. Suddenly someone who I’d always relied on, always been able to turn to, knew would always be there for me simply wasn’t. I had to keep on talking to them, but they were no longer able or willing to listen – or so it seemed. It felt shocking, disorienting, as though the sky had parted to reveal nothing but emptiness beyond, or as though the world I inhabited were revealed to be just a fibreboard film-set like in The Truman Show. It seemed as though all the real meaning and purpose had gone out of the world. Everything carried on the same as before, everything looked the same, but it all felt strangely empty now, pointless, a bit meaningless – that the life had moved on and left only the hollow shell. I also felt something of that sense that C.S. Lewis recorded in A Grief Observed – pounding on heaven’s door and being met not merely with silence, but the sounds of bolts being drawn against you. A paradoxical sense both that there’s no one at home, and they don’t want to talk to you. So it’s an experience both of absence, that God isn’t there at all, and also of abandonment, that he does exist but has chosen to leave you. On reflection, a number of obvious things led up to this episode. Firstly, I’ve had several recent experiences of going to church (mostly mainstream evangelical churches) and feeling alienated, like an outsider. I’ve felt excluded by the songs, the sermons, the prayers and the testimonies, and have come away with the sense that I’m just not a true Christian. And this has merely reinforced a nagging longer-term feeling that I simply don’t look, think, talk, believe or act as a real Christian should. I sometimes feel (rightly or wrongly) that my Christian faith is little more than a façade or charade; that deep down I’m more of a pagan than a Christian – certainly if conservative evangelical Christian theology and practice is what we’re aiming for. And then recently a difficult set of family circumstances has arisen that I won’t go into here. While in the midst of this I’ve found it very hard to see God’s presence or activity in it (though taking a step back, I’m sure he has been in it). At the risk of sounding melodramatic (or just bonkers), at times I’ve felt almost under a curse, or simply abandoned by God – that he simply isn’t listening to my prayers. Being tired and losing a sense of perspective haven’t helped of course. Some smaller things haven’t helped either. Watching The Woman in Black this week as escapism left me with a pervasive sense of darkness and evil, that the universe is ruled by hate and fear not love and goodness. And finally, the last straw if a very daft and trivial one. Twice in the past two weeks, the cross I’ve worn around my neck for many years has fallen off, once in the middle of a conversation about faith in which I was already feeling like I wasn’t a proper believer. I know it sounds silly and superstitious (and probably is), but it felt to me like a sign or a judgement; God saying ‘you’re not one of mine any more’. This was partly because it recalled a time many years ago when my then vicar prayed and prophesied over me: ‘God’s saying that like the fish symbol you wear round your neck, he’s holding you and will never let go of you’… and then a couple of days later I realised that the fish pendant had fallen off and was lost. It felt like God rejecting me. So do I still feel this way a few days later? No, not really. From the outset, my journey of faith has been punctuated with occasional (mostly fleeting) moments of doubt, of the sense that God wasn’t there or wasn’t interested – this one was just deeper and longer-lasting than most. But it has equally been punctuated by moments of grace and encounter, of the sense of God’s presence and care, often despite circumstances. I suspect that these are all necessary elements in the life of faith, and we need to learn to accept (perhaps even embrace) each of them in their season. And in a way, this experience of absence has driven me to seek God more deeply, and to examine my own heart and life to see if any of the cause lies in me. Which it probably does. And of course, when we feel abandoned by God we’re in the best possible company. Jesus himself experienced such absence and abandonment in Gethsemane when God didn’t answer his prayers (‘Father, take this cup away from me’), and ultimately at Calvary (‘My God, my God, why have you forsaken me?’). So perhaps there is a positive way to view such an experience – as sharing profoundly with an aspect of what Jesus went through to redeem humanity and the cosmos. I believe that many mystics and saints have experienced similar times and ultimately drawn closer to God through it. Though in my case I suspect it was nothing quite so grand or noble. Probably nothing that a few good nights’ sleep wouldn’t cure.